My neighbor in Rehoboth mentioned that if I was going to Annapolis, I should check out the Annapolis Towne Centre where shops and restaurants where right next to each other. Sounded interesting and, definitely, worth checking. I dragged my friend, Paula, to Annapolis with me for the day. I don’t think she minded too much. I needed to drop my car off for its first service and one more errand to the Annaplis Mall. You probably don’t care about all this info. but this is why I went to Annapolis. It wasn’t just to shop and dine until I dropped. No way, never. 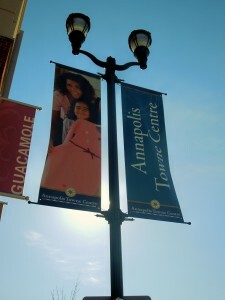 The Annapolis Towne Centre at Parole is located at 2505 Riva Rd. There are different ways to get there from Rt. 50. It is a complex of shops, apartment living, Whole Foods, and restaurants. 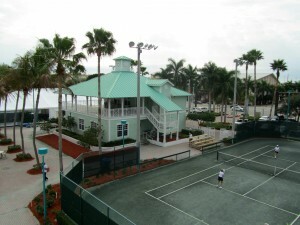 By visiting http://www.visitatc.com, you can find directions and what they offer. Residences are above the retail spaces with anchor stores and restaurants around. Plenty of parking and the valet service is only $2. 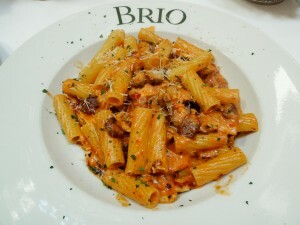 We were hungry and right in front of the valet service was a restaurant called Brio. We went right in. 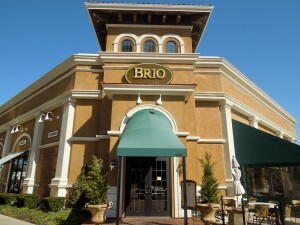 I had never been to any of the Brio restaurants. Did not even know it was a chain of restaurants found nationwide. Their website is http://www.brioitalian.com. They consider themselves “upscale affordable”; appealing to a broad base of customers. 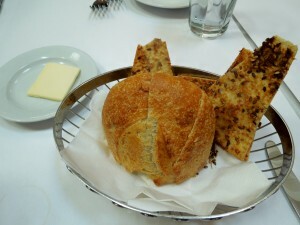 We were served bread accompanied by a flat bread that was very good. 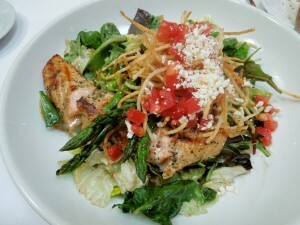 Paula decided on the Grilled Salmon Salad, with Roma tomatoes, asparagus, feta, crispy shoestring potatoes and balsamic vinaigrette. The presentation was pretty and she thought it was good. Mine was the Pasta Brio, Rigatoni (cooked al dente), grilled chicken, tomatoes, pine nuts and a cilantro pesto drizzle. Well seasoned. In my household we eat gluten free and as I was eating “real” pasta, I thought it was good but I find the gluten pata products just as good. No dessert, just coffee for us. It was such a beautiful day that a stroll through the Towne Centre is what we wanted to do. 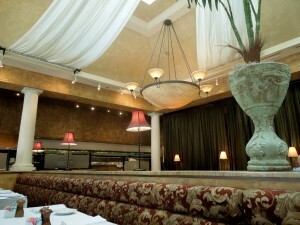 By the way, our service at Brio was very good; our server was attentive and knew his menu well. We stopped at a really cute store called Poppy and Stella. They are located at 1910 Towne Centre Blvd., Suite 123. Website is http://www.poppyandstella.com. I want to come back and write a post on them. On this particular visit, all I can tell you is that it had great shoes and accessories; no clothing, though. 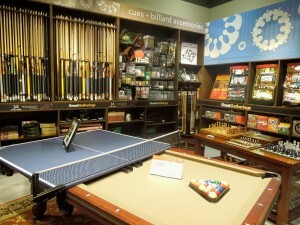 They also have a store at 728 S. Broadway in Fells Point, in Baltimore, Maryland. 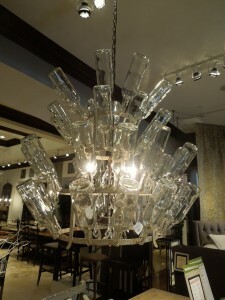 Continuing our stightseeing we stopped at Arhaus (pronounced “our house”), located at 1905 Towne Centre. Tel. 410-266-0555. Website? 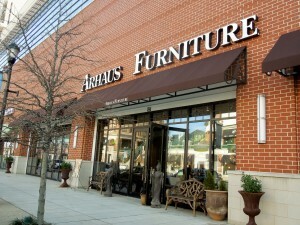 http://www.arhaus.com. They told us that while many stores around the country are closing shop, Arhaus is continuing to open more stores nationwide. Arhaus has a “global approach to designing all of their products; providing customers with a selection of unique, one of a kind pieces”. The store had beautiful furniture, upholstering choices. Gorgeous tables and home accessories. 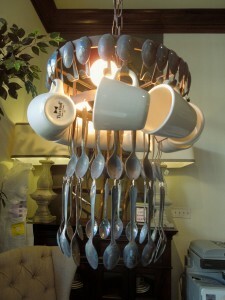 Definitely unique, the following chandeliers caught our attention. 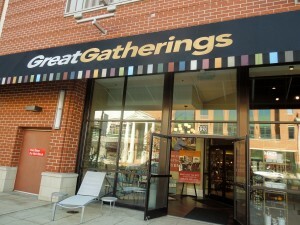 Another store we found very interesting was Great Gatherings. 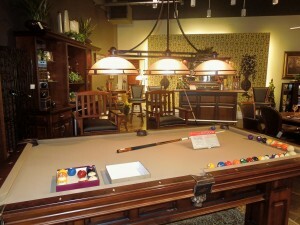 With a motto of “Play Up Your Home”, you will find pool tables, stools, bars and game room accessories and furniture. 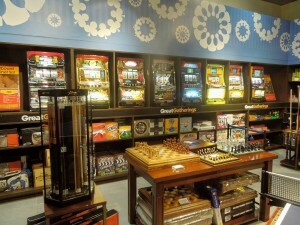 Let’s say you will be impressed with their entertaining essentials, as well as with all their outdoor fun furniture. Great Gatherings can be found at 1905 Towne Center Blvd., Suite 120. Tel. 410-266-1111. Website? 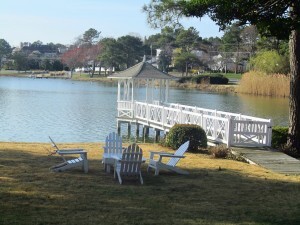 http://www.mygreatgatherings.com/find/annapolis. Those were just a few of the stores. Target was there, Sur La Table from California, tapas and sports bars/restaurants, men’s shops, women’s shops….too tempting to live under such harsh conditions…haha…talk to you later. I thought nobody would be eating out the day after Valentine’s Day. How mistaken I was, when my husband and I decided to go to Stingray, located at 59 Lake Ave. Tel. 302-227-6476. Website? 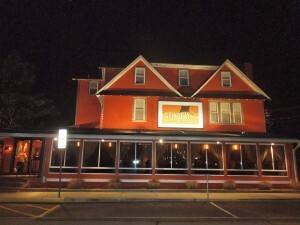 www.stingrayrestaurant.com. It was crowded, lively and with plenty of young people. This restaurant is a favorite of many. It is trendy, hip and cool. A full bar with plenty of seating; a lounge on one side of it offers comfortable sofas and lower tables for casual conversation and mingling. Pictures? Sorry, it was crowded and you have to give people their privacy. Stingray does not close during the week. It is open every single day. Mondays through Fridays it opens from 4 p.m. until 1 a.m. On Saturdays and Sundays it opens at Noon until 1 a.m. Check the website above mentioned. You will be able to go through the menus. 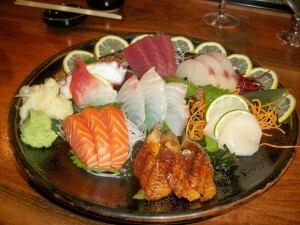 Stingray offers catering and check for upcoming sushi cooking classes that are held at the restaurant. Ever since I started my blog I have repeated many times that all my reviews and pictures of restaurants are my personal opinion. I enjoy going out to dinner; could be a hot dog stand, a food truck, casual or fine dining. At times, I like a a restaurant on a specific night; other times the same restaurant might leave me lukewarm. 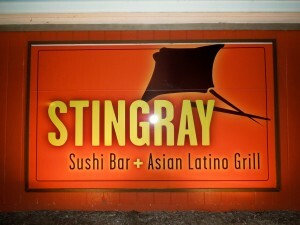 With all that said, then, this is my review of my visit to Stingray on 2/15/12. I liked the atmosphere and the music. I felt I was eating at a lounge; lights dimmed just enough; fun and relaxing at the same time. 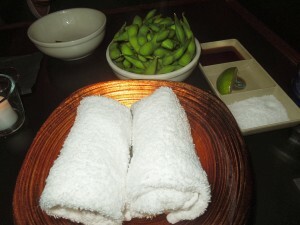 We ordered some edamame with a soy ginger dipping sauce, fresh lime and sea salt. I love plain edamame; the dipping sauce was excellent. Towels to clean our hands had been brought to the table already. My husband ordered sushi rolls. Unakyu which was a grilled fresh water eel and cucumbers, outside sesame seeds. 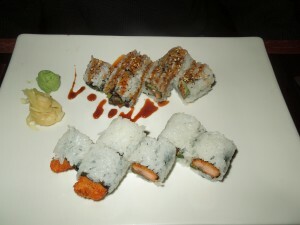 And, the Man Eater which was fried fresh salmon with jalapeno and spicy mayo; sprinkled with chopped fresh cilantro. I noticed he was just looking at them and eating them really slow. Not thrilled. You know, you can tell when the person is hesitant. I decided to try one of them. The best way to describe it? Boring. There were no games playing with your tastebuds. He managed to eat most but left a few on his plate. 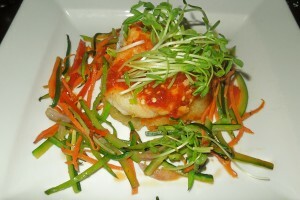 On the other hand, my Chilean Sea Bass, sambal chili glazed with a crunchy sticky rice cake and bamboo shoot salad was excellent. The fish was perfectly cooked and seasoned. A bite of the sea bass with the crunchy sticky rice was the best. Talking about having a party with my tastebuds. No dessert for us on that evening….will be back to study the sushi menu once again. Note: I asked for fresh wasabi; our server said they did not have any. Hopefully, they will add it to their menu. It does make such a difference. Small communities like our beaches consider their residents, families. They have businesses, raise families and get involved. Steve Falck and his family have been in the Berlin and Ocean City, Maryland area for so many years. Steve was a builder, Patty has been a teacher, is still an artist and a shopkeeper. You have been to her stores, TaDa, in Berlin, Maryland. Her own daughter, Blair, had Blair Elizabeth in Rehoboth for years; now with TaDa in Berlin, as well. Brooke is a Spanish teacher in Delaware. Then, the news came in 2009. Steve was diagnosed with MSA. Multiple Systems Atrophy. And, what is it? It is a very rare and progressive, neurodegenerative disorder with no known treatment or cure. Most of us would collapse at those news. Steve and his family have rallied to get informed and to also bring it to the attention of others. Much research is needed. And, Steve needs our help, as well. The first thing the Falck family did was establish a foundation. It is the Stephen Falck Foundation. Website? http://www.stephenfalckfoundation.com. By establishing this foundation, they are hoping that by funding research, they may help those currently suffering, and provide hope in the future for a cure. Please visit the website, for further info. To know more about MSA, you can also visit www.wemove.org/msa/ and www.en.wikipedia.org/wiki/multiple_system_atrophy. Saturday, March 3rd – Happy Hour with Steve – Silent Auction and Cocktail Party from 4:00 p.m. until 7:00 p.m. – Stix for Steve will be held at the Bonfire Restaurant located at 71st St. & Coastal Highway, Ocean City, Maryland. Website? 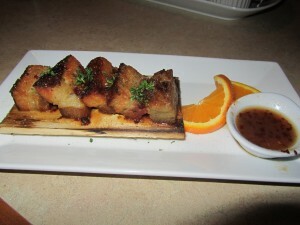 www.thebonfirerestaurant.com. Tickets are $20 and can be purchased at NEST, 11 South Main St., Berlin, Maryland, at the Bonfire Restaurant, and at Malibu Surf Shop at 8th St & The Boards in Ocean City, Maryland. You can also purchase tickets directly from www.stephenfalckfoundation.com. You may call Renee Shettle at 410-726-5295, Dee Gilbert at 410-629-1030 or Tiffany Wyatt at 443-880-2572. These ladies are in charge. There will be hors d’oeuvres, a cash bar and a silent auction fundraiser. Donations to the silent auction are sill encouraged and appreciated. Call the above telephones if you wish to donate an item. With the support of the community they will be able to provide the medical care that Steve requires now and in the future as this disorder progresses. The Stephen Falck Foundation, Inc. is a 501(c)(3) not-for-profit charitable organization. Your contribution is tax deductible to the extent allowed by law. Sunday, March 4th – Steve was a girl’s lacrosse coach and on this day a Girl’s Lacrosse Festival will be on going, for the fun of it. Time 9:00 a.m. until 4:00 p.m. at Crown Sports Center located at 2840 Crown Rd., Fruitland, Maryland 21826. You can check Crown Sports Center’s website for directions at www.crown.sportscenter.com. More info? Call the above telephone numbers. Steve Falck Fundraiser can be found on Facebook. 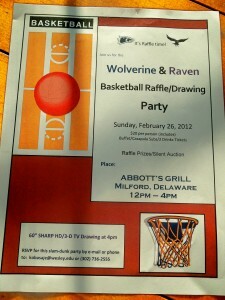 It’s a Basketball Raffle/Drawing Party for the Basketball Teams of Wesley College, and St. Thomas More Preparatory School, The Wolverine & The Raven, Fundraising Event, Sunday, February 26th, at Abbott’s Grill, Milford, Delaware, Noon until 4:00 p.m.
Two schools in Delaware together are having their Fundraising Events to benefit their Basketball Teams. Wesley College and St. Thomas More Preparatory School. The Wolverine, and The Raven. Both of these schools are located in Dover, Delaware. Wesley College is located at 120 North State St. It is Delaware’s oldest private college, founded in 1873. The women’s basketball team is The Wolverines. School website? http://www.wesley.edu. St. Thomas More Preparatory School is located at 139 Thomas Drive, Magnolia, Delaware. It is an independent Catholic High School. School website? http://www.saintmore.org. Join players, families and friends for the Basketball Raffle/Drawing Party Sunday, that’s tomorrow, February 26th, from Noon until 4:00 p.m. Venue? Abbott’s Grill located at 249 NE Front St., Milford, DE 19963. Tel. 302-491-6736. Website? www.abbottsgrillde.com. $20 per person, includes buffet, Casapulla Subs and 2 drink tickets. There will be raffle, prizes and a silent auction. The drawing for the 60″ Sharp HD/3-D TV will be at 4:00 p.m. If you have any questions, please call 302-736-2555. Comments Off on It’s a Basketball Raffle/Drawing Party for the Basketball Teams of Wesley College, and St. Thomas More Preparatory School, The Wolverine & The Raven, Fundraising Event, Sunday, February 26th, at Abbott’s Grill, Milford, Delaware, Noon until 4:00 p.m.
Good Morning Delray. Cloudy or sunny in South Florida? Does not matter because the following events and activities can be enjoyed in most any kind of weather. 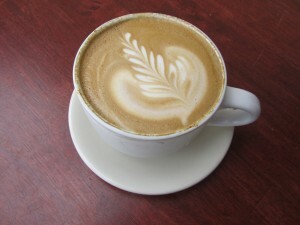 If you are awake, grab your cup of coffee and head out to downtown Delray Beach. 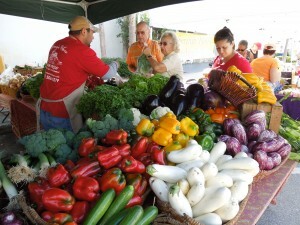 On Atlantic Avenue you will find this morning from 9 a.m. until 2 p.m. the Delray Beach GreenMarket. This Market is part of the Community Redevelopment Agency. The resurgence of farmers markets offering homegrown produce, baked goods, flowers, and even music is a great way to start the morning. The GreenMarket is right on this Village by the Sea, south of Atlantic on SE 4th Ave. Can’t miss it. Easy parking at this time of the morning. 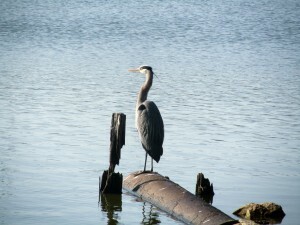 After strolling the GreenMarket go east on Atlantic and stop just short of the Intracoastal Bridge, at Veterans Park. 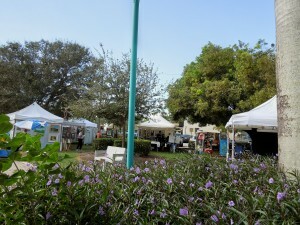 There, you will find Artists in the Park, presented by the Delray Art League. Saturday and Sunday from 10 a.m. until 4:30 p.m.
Artists in the Park has been in the community for 47 years. It is South Florida’s longest running outdoor fine art show and sale. There is plenty of parking available. And, since you are there, already, and probably exhausted of walking, strolling and shopping, then you might as well take a couple of hours and cruise on Lady Atlantic and Lady Delray; Delray Yatch Cruises. It is an intracoastal cruise, north or south of it. 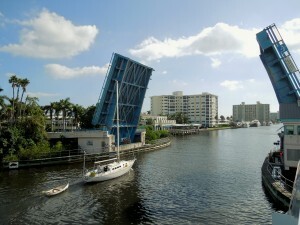 For schedule, information, prices and specialty cruises, please visit www.delraybeachcruises.com. Tel. 561-243-0686. I have taken the cruise and it was a relaxing way to spend a few hours; beautiful scenery. Now that you are relaxed after your cruise, get back in the car and go west on Atlantic Ave. A visit to the Cornell Museum would be a nice thing to do while in Delray Beach. The Museum is located at 51 N. Swinton Ave. 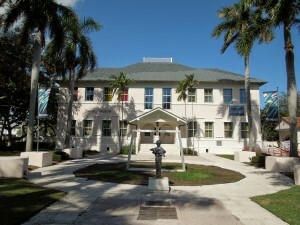 It is in the restored 1913 Delray Beach Elementary Building, and, connected to the Crest Theatre building. The Cornell Museum of Art and American Culture is open Tuesdays through Saturdays from 10:30 a.m. to 4:30 p.m. Sundays from 1 until 4:30 p.m. Closed on Mondays. Check out the website http://www.oldschoolsquare.org. 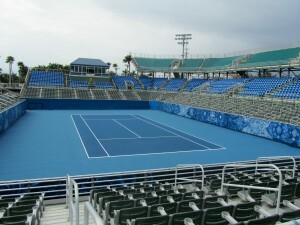 Granted, this week-end might be a little crowded near the Cornell Museum and that area of Atlantic Ave. That’s because the Delray Beach International Tennis Championships (ITC) are being held at the Delray Beach Tennis Center, 201 Atlantic Ave. Tel. 561-243-7360. Two websites to check if you are a tennis aficionado. One for schedule is http://www.yellowtennisball.com/online2/schedule.html. The other? For special events and offers. http://www.yellowtennisball.com/online2/special-events-a-offers.html. 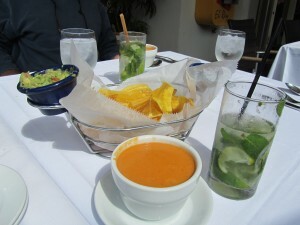 And, if all that fails, well……lunch and mojitos from Cabana will keep you very relaxed…. When looking for information regarding what’s going on at the Delaware Beaches, I look for activities, events and entertainment that really interest me. There is so much going on. If you really put your mind to it and your fingers to your computer or telephone keys you can probably find the same info. I am just trying to make it a little easier for the visitors to find them, highlighting some of the fun things at our beaches. Busy little towns, we are!! Some of the events are for this week-end; others, you might want to come back for. Friday, 2/24 – Monthly Screenings, presented by the Rehoboth Beach Film Society feature films and discussions about the various cultures in the world. Oscar Shorts for Award Consideration – Doors open at 6:30 p.m. at Movies at Midway located on Coastal Highway in Rehoboth Beach. Admission is $4 for members and $6 for “future” members. The screenings will be at their upstairs screening room. Following the screenings, local film critic Rob Rector will lead a discussion about what makes each film eligible for award consideration and you will be able to vote for your favorite. You can visit http://www.rehobothfilm.com/film_events_monthly_screenings.html for more info and to check the trailers of the 5 Oscar Shorts. Pentecost – A young Iris boy faced with a difficult choice between the duties at Church, and his love of football. Raju – A German couple adopts an Indian orphan in Calcutta, only to have him disappear. The Shore – Two boyhood friends reunite in Northern Ireland after 25 years. Time Freak – A neurotic inventor who hopes to correct his past mistakes by creating a time machine, in this comic take on science fiction stereotypes. Tuba Atlantic – With only 6 days to live, 70 year old Oskar wants to put things right with his brother. Silver Lake - Almost that time of the Year!! Until, Sunday, March 4th – Exhibit at the Rehoboth Art League, located at 12 Dodds Avenue inside Henlopen Acres. “The Other Side of Howard Schroeder” Works rarely seen from the Family collection. The exhibit is presently taking place at the Corkran Gallery. There is something for everyone. The League is open Mondays through Saturdays from 10 until 4 p.m. and on Sundays from 12 until 4 p.m. Visit the website because they have a lot going on www.rehobothartleague.org. Saturday, 2/25 – Andy Warhol; A Documentary Part 1 (2006) – A Film by Eric Burns, at Gallery 50 located at 50-B Wilmington Ave., Rehoboth Beach. Tel. 302-227-2050. Reception at 6:30 p.m. with the screening starting at 7:00 p.m. Website? http://www.50contemporaryart.com/2012/events. Gallery 50 opened in 2007. In July, 2011 G-50 Fine Art Photography opened at 50-B Wilmington Ave., showcasing the work of Gallery 50’s photographers. Tel. 302-227-2240. Friday, 2/24 and Saturday, 2/25 – Entertainment at the Cultured Pearl, located at 301 Rehoboth Ave. Mike Garvilla from 8 p.m. until 11 p.m. Live Acoustic Music. Sunday, 2/26 – Classic Dinner Specials at the Cultured Pearl for $14.95. Entertainment? Bryan Clark from 6 p.m. until 9 p.m. More info? Call 302-227-8493. Website? http://www.culturedpearl.us. Thursday, 3/1 – Mario Rocco at the Big Fish Grill from 6 p.m. until 10 p.m. Reservations Only!! Please call 302-227-9007, or 227-3474. Seating is $15 per person. 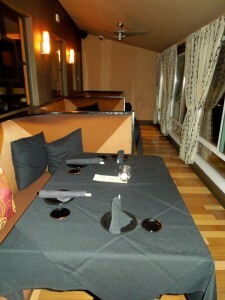 Dinner is not included but will be available to order a la carte off the regular Big Fish Grill dinner menu. Payment for the show must be made when you sign up. Mario Rocco’s Parade of Stars with Images of Elvis. Special guest Billy Logue and a tribute to the music of Frank Sinatra. 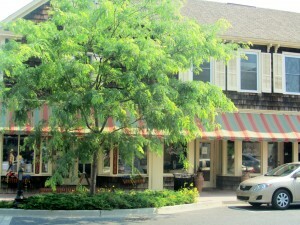 Big Fish Grill is located at20298 Coastal Highway, Rehoboth Beach. Tel. 302-227-Fish. Website? www.bigfishgrill.com. Saturday, 3/3 – It is the 22nd Annual Rehoboth Beach Chocolate Festival from 11:30 until 3:30 p.m. One Day Only!! Taste hundreds of delectable chocolate recipes. $2 entry fee includes one taste – children under 5 years of age are free!! This is a very popular event. Get there early!! 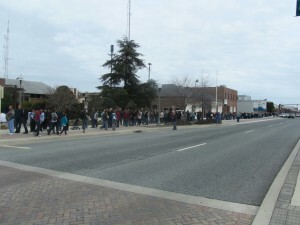 The line wrapped around the block on Rehoboth Ave.
Additional tastings are .50 each. Purchase tickets at the door or in advance at the Main Street Office, Aura, Carltons, Cake Break or Boardwalk Plaza Hotel. Anyone can enter their best chocolate creation to be judged for free. 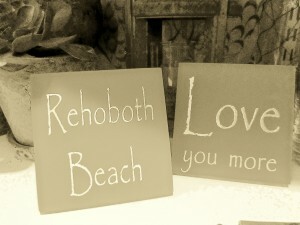 Download categories, rules and entry forms are at www.downtownrehoboth.com. Enter your baked goods between 7 and 8:30 a.m. at the Convention Center in downtown Rehoboth Beach. Great raffles prizes, games for kids, fantastic vendors and more chocolate in one place than you have ever dreamed possible. You can call 302-227-2772 or 302-227-8259. Sunday, 3/4 – Cultured Pearl 20th Anniversary Buffet Extravaganza – One Day Only!! 2 hour seatings, starting at Noon. 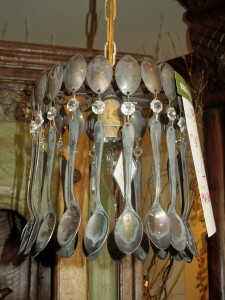 Cultured Pearl is located at 301 Rehoboth Ave. Booked on the hour. Last seating is at 9 p.m. $32 all you can eat. Call 302-227-8493 for reservations. Website? http://www.culturedpearl.us. Going to Baltimore for the day is no brainer. The Delaware Beaches are so close to major cities, like Baltimore, Washington, D.C. and Philadelphia. A day trip is an easy one. I lived in Baltimore years ago. I have always liked it. It is a small city comparing it to the nearby ones. Like all of them it has the good, the bad and the ugly. I tend to concentrate on the good. Baltimore is a city of many firsts. Many U.S. cities would love to have what Baltimore has to offer. A City of Firsts, yes indeed, with innovations throughout its history. Advances and inventions in industry, transportation, science, and education. Hospitals that are world renowned; a port, the Orioles, the Ravens, ethnic neighborhoods, fantastic restaurants. A Farmers’ Market in its 35th year, right in the middle of the city. 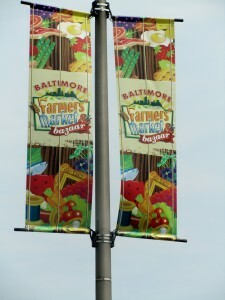 Visit the website http://www.Baltimore.org/about-baltimore/baltimore-firsts. Can’t wait to see the celebrations kicking off the Bicentennial of the War of 1812. Fort McHenry is the birthplace of our National Anthem; The Star Spangled Banner. 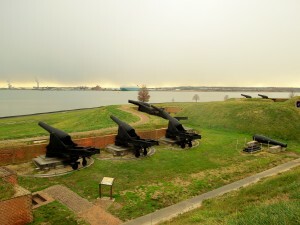 http://www.baltimore.to/fort-mchenry.html. People don’t tend to move from Baltimore. And, if they do, they always come back. They do drive a lot of Volvos too. I have never seen so many. We invited my sister in law, Susie, to have lunch. 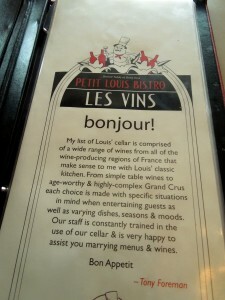 Our choice was Petit Louis Bistro. 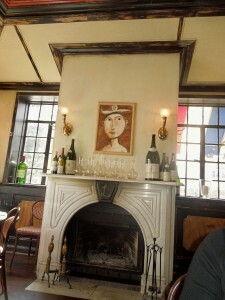 This is a classic French bistro located 4800 Roland Ave., Baltimore. Tel. 410-366-9393. Website? 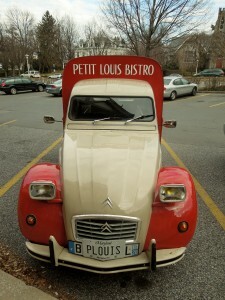 http://www.petitlouis.com. 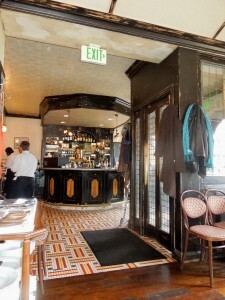 There is more to where this bistro is located. 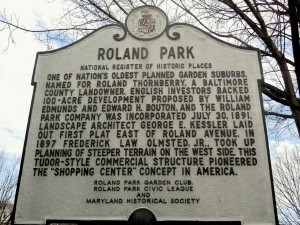 The neighborhood is called Roland Park. It was the first planned suburban community in North America, developed beween 1890 and 1920. Also, the actual building is very interesting. You see, this single Tudor style, small, shopping strip where Petit Louis is located, is the world’s first shopping center; opened in 1907. 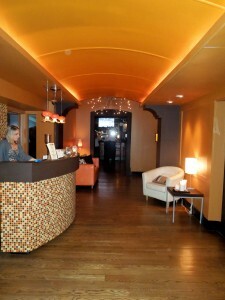 As you enter, you will find a full bar and two dining rooms. They are both very comfortable. 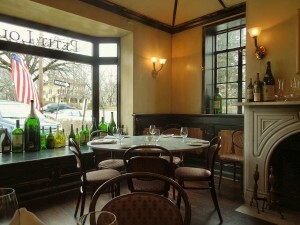 Petit Louis opens for lunch and dinner. They also have a brunch on Sundays. 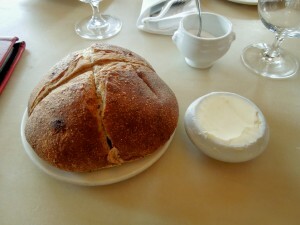 Our server was friendly, and immediately presented us with sourdough bread and homemade butter. 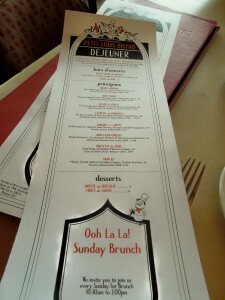 For lunch we had the choice of a Prix Fixe menu for $22. 3 courses included iced tea and coffee. We liked the choices so Susie and I decided on this type of menu. We both chose the Petite Salad de Mesclun. 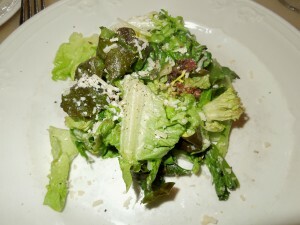 Local Mesclun greens, Reggiano and a red wine vinaigrette. Nicely seasoned, and simple. Susie chose the Croque Monsieur. 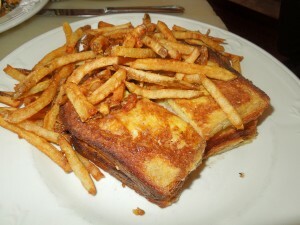 This was a sandwich of sliced Madrange ham, Gruyere cheese and frites. Even though this is a standard on their menu, Susie thought it was the best one yet. 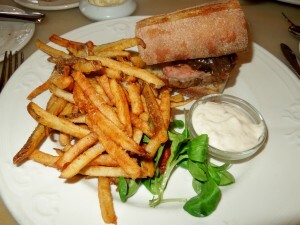 I had the Louis Casse-Croutes which was a steak sandwich, medium temperature, with caramelized onions, frites and a delicious horseradish aioli. It really was so good. My husband decided to go a la carte with all hors d’oeuvres for his lunch. 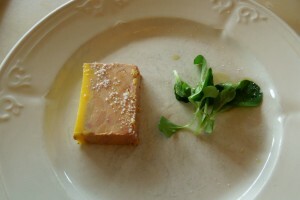 The first was a Terrine a la Mode Landaise. It was a Foi Grass Terrine, without the grilled baguette, due to his gluten allergy. Loved it. 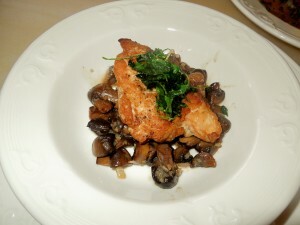 Ris de Yeau which was a Sauteed Sweetbread with button mushrooms in a Madeira reduction. Sweetbreads are not served in many restaurants; Baltimore seems to have them available. He thought they were perfectly cooked. 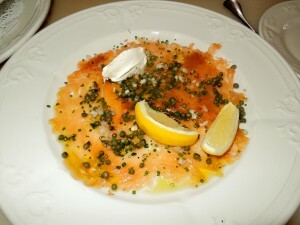 He also had the Gravlax, which was the House Cured Salmon Gravlax, with capers and creme fraiche. Paper thin and beautiful. Susie and I had the choice of desserts. 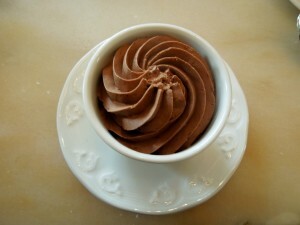 I loved the Mousse au Chocolat. I always forget how good this dessert is. 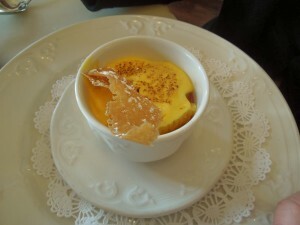 Susie had the Fruits de Saison; a citrus custard on top. What’s Going On?, Lewes, Delaware, Activities, Events, Entertainment, The Delaware Beaches, That’s All You Need!! Almost that time of the Year!! 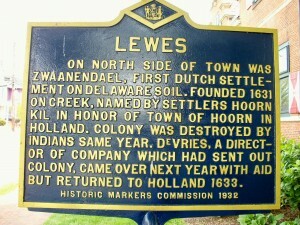 Founded in 1631 Lewes is located where the Delaware Bay and the Atlantic Ocean meet. It is such a walkable town; shops, restaurants, museums all within a few blocks. The scenery is beautiful and the residents are so protective of this very first town in the first state. 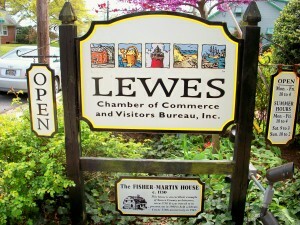 So, if you are visiting the Delaware Beaches, check out what Lewes is offering this coming week. Thursday, 2/23 – The Zwaanendael Museum located at 102 Kings Highway presents Archaeological Illustration Through Stipple Drawing” Tips of the Trade. It is a workshop on illustrating historical artifacts through the art of stipple drawing. Led by historical interpreter and artist, Sharyn Murray. Program starts at 2 p.m. The Museum opens at 10 a.m. until 4:30 p.m. It is free admission. More info? Call 302-645-1148. 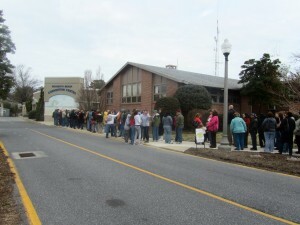 Friday, 2/24 – It is the 75th Annual Oyster Eat at the Georgetown Fire Hall in Georgetown, DE. This is a Men only event and it has been long standing in Sussex County. A tradition, shall we say. 7 p.m. until midnight. For information, please call 302-841-0877. Friday, 2/24 – The Women’s answer to the Men’s Oyster Eat. It is the 23rd Annual Shrimp Feast at the Lewes Fire Hall in Lewes from 7 p.m. until midnight. For more information, please call 302-645-6556. 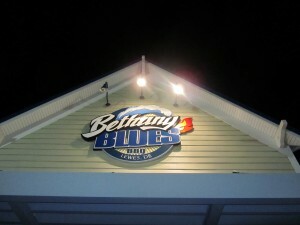 Friday, 2/24 – Sydney’s Revival at Bethany Blues, Lewes, located on 18385 Coastal Highway (Rt.1). At 8 p.m. More Info? Visit http://www.bethanyblues.com. On Friday the 24th Daddy Mack Blues Band will be the entertainers and on Saturday, the 25th Galaxy Collective will be main act. Bethany Blues is in a casual environment with great food. If you have a gluten allergy, you can eat at this restaurant with ease. Just mention it to your server and you will get great service. Saturday, 2/25 – Coastal Concerts present Carpe Diem String Quartet at 8 p.m. at the Bethel United Methodist Church Hall, located at Fourth & Market Sts. 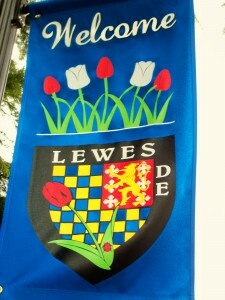 in Lewes. Tickets are $25. Ages 10 to 18 are free. For tickets and further info., please call 888-212-6458. Or, visit www.coastalconcerts.org. 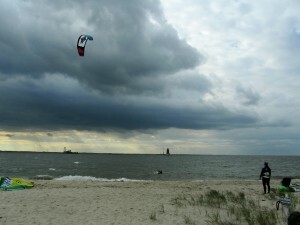 The Cape Henlopen State Park encompasses over 7,000 acres of beach, dune, forest and wetland at the mount of the Delaware Bay. 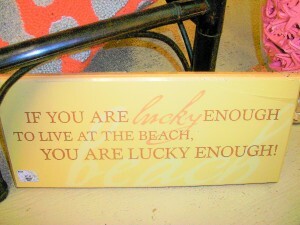 There are 4 miles of ocean and 2 miles of bay beach. 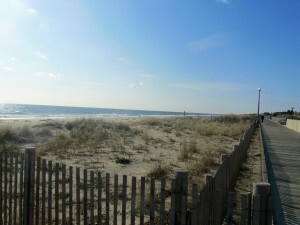 The State Park is so important for all of us that live at the Delaware Beaches. It is enjoyed by so many visitors, as well. The Park offers a variety of recreational, historical and natural opportunities for all ages. It is located at 15099 Cape Henlopen Drive, Lewes, DE 19958. Tel. 302-645-8983. 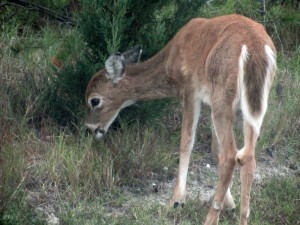 Seaside Nature Center 302-645-6852. Saturday, 2/25 – It is the Semi-Annual Book Fair hosted by the Friends of Cape Henlopen State Park. Food and homemade baked goods will be available. This is a private, non-profit (501(c)3) member-supported organization working with the Division of Parks and Recreation and staff of Cape Henlopen State Park. This group holds throughout the year different fundraising events like Bird Seed Sales, Used Book Fairs, Chocolate Tastings, Wine, Cheese, & Beer Tastings, Flea Markets and Fishing Tournaments. 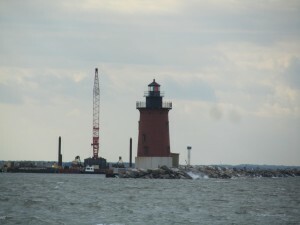 You can check them out at http://www.friendsofcapehenlopen.org. This Saturday is their book fair at the Seaside Nature Center, which is inside the Cape Henlopen State Park. Book donations can be dropped off Friday, the 24th, from 10 a.m. until 1 p.m.
Events like this one support activities at the Park like Borrow-A-Bike Program, Monthly Trails Day, Playground Program, Park Beautification, and the Osprey Camera. Saturday, 2/25 – Cold War at Fort Miles at 11 a.m. Take a tour of Fort Miles and learn what took place on this base during the Cold War. Hear tales of Doomsday ships, Soviet spies, tracking Soviet submarines and more. For ages 10 and older with an adult. $3/ person. Please call to register at 302-645- 6852. You will need to meeet at the Orientation Building in the Fort Miles Historic Area. To get there, follow the “Fort Miles” signs to the Historic Area parking lot. Walk the paved road through the Cantonment Area to the Orientation Bldg. which is the last large building on your right. Fort Miles was a key part of the nation’s coastal defense during and After WWII. 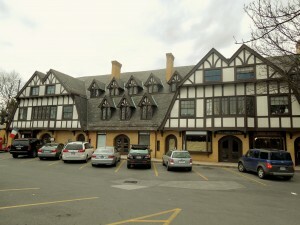 In April of 2005 it was added to the National Register of Historic Places. In Dover (25 minutes North from the Delaware Beaches) on Saturday, 2/25 – The Delaware Breast Cancer Coalition presents Southern Lights of Life. It is an Evening of Living & Giving. It is Delaware’s Premier Breast Cancer Event. Venue? Dover Downs Hotel & Casino in Dover. It is a fundraising event. Tickets start at $150/person. Dress? Business to Glamorous. Cocktails and hors d’oeuvres will start at 6 p.m. Silent auction will be open. The program, dinner and Live Auction will start at 8 p.m., followed by an exciting fashion show featuring breast cancer survivors as models. Auction check-out will begin at 10 p.m. Comments Off on What’s Going On?, Lewes, Delaware, Activities, Events, Entertainment, The Delaware Beaches, That’s All You Need! !